Landscape painter, muralist. Born in Washburn, MO on March 1, 1883. Payne left home at age 14 and found work painting houses, stage sets and signs. His travels took him through the Ozarks and into Mexico. Except for a brief period at the Art Institute of Chicago, he remained a self-taught artist. 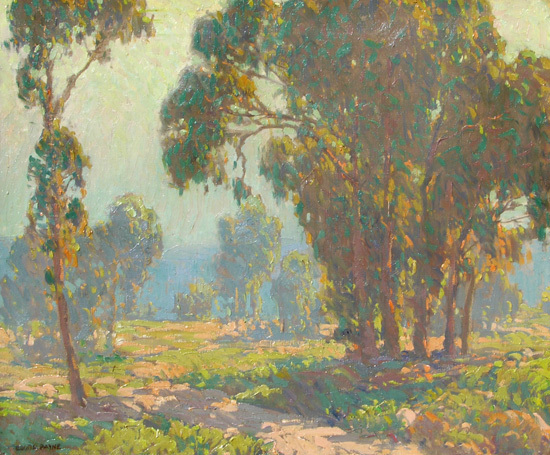 On his first visit to California in 1909 he spent several months painting in Laguna Beach before visiting San Francisco. 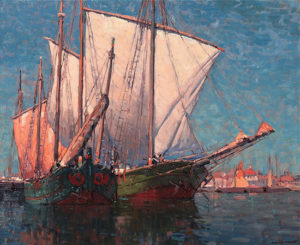 While in San Francisco, he met artist Elsie Palmer whom he married in Chicago in 1912. In 1917 he returned to Glendale, CA with a commission from Chicago’s Congress Hotel for a mural of 11,000 square yards of muslin which was accomplished with the help of other local artists and installed shortly thereafter. 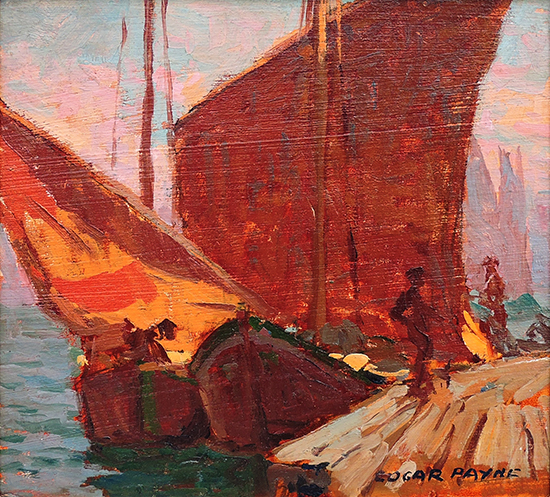 In 1918 the Paynes established a home and studio in Laguna Beach, where he organized and became the first president of the local art association. 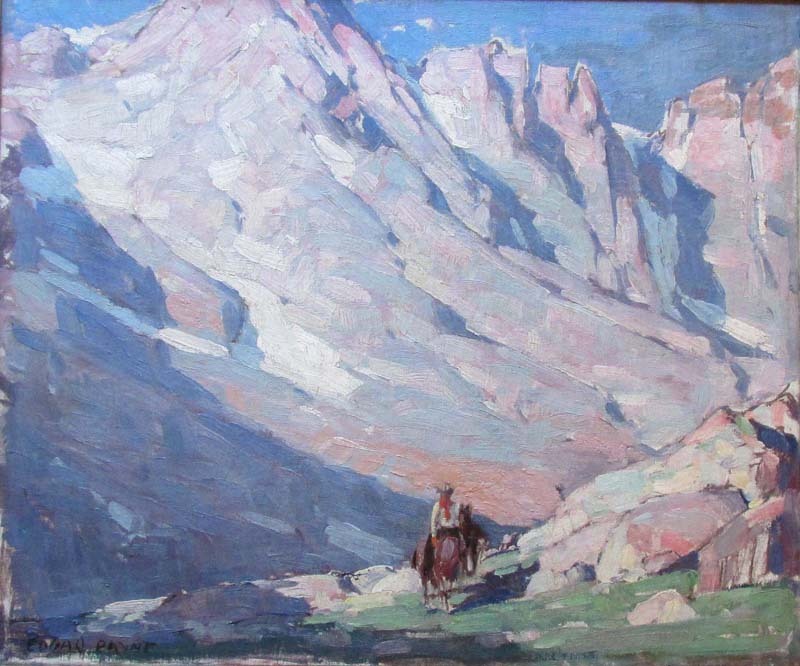 He continued painting and exhibiting in Los Angeles and Laguna until 1922 when he and Elsie began a two-year painting tour of Europe. During the next few years their winter residence was mainly in and around New York City. 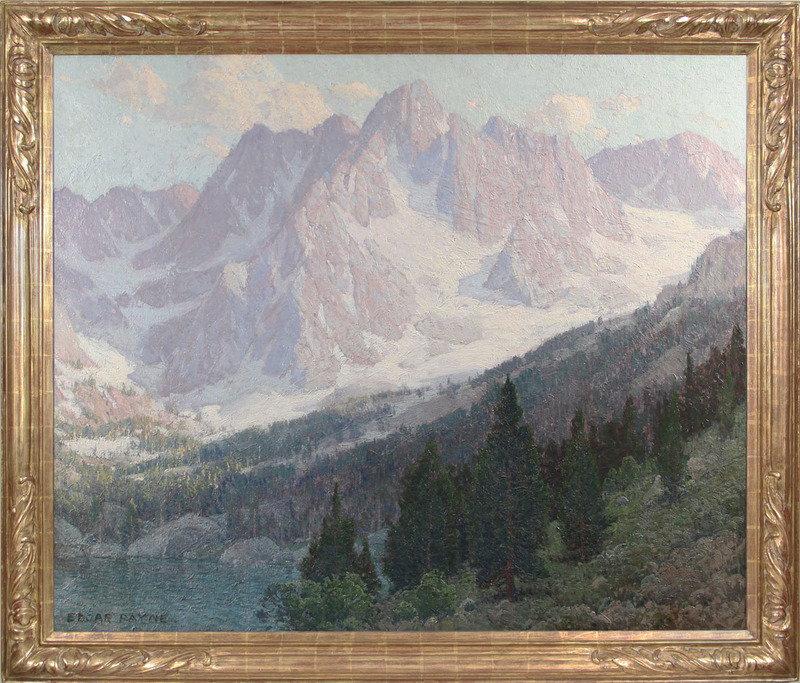 Payne is internationally famous for his canvases depicting Indians riding through desert canyons and landscapes of the Sierra Nevada and Harbor scenes of France & Italy. 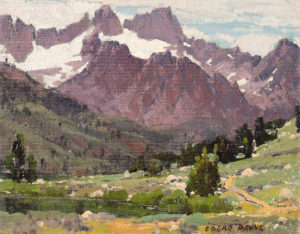 He produced a color motion picture called Sierra Journey, and Payne Lake in the High Sierra is named for him. 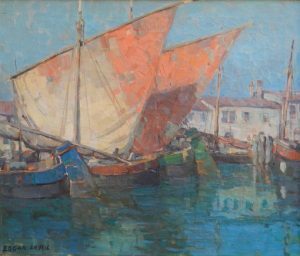 Member: Salmagundi Club; Allied Art Association; International Society Art League; California Art Club (President 1926); Laguna Beach Art Association; Ten Painters of Los Angeles; Palette & Chisel Club, 1913; Chicago Society of Artists; American Artists Professional League; Carmel Art Association. Exhibited: California State Fairs, 1917 (prize),1918 (prize); Sacramento State Fair, 1918 (gold); Sacramento, 1919 (medal); Los Angeles County Museum of Art, 1919 (solo), 1926 (gold medal); Art Institute of Chicago, 1920 (prize); Southwest Museum, 1921 (prize); Pennsylvania Academy of Fine Arts Annual,1921,22,25; Paris Salon, 1923; National Academy of Design, 1929 (prize); Golden Gate International Exposition, 1939; California Art Club, 1947 (prize). Works Held: murals, Empress Theatre & American Theatre, Chicago; Clay County Court House, Brazil, IN; Hendricks County Court House, Danville, IN; Queen Theatre, Houston; Nebraska Art Association, Lincoln; Peoria Society of Allied Artists; Herron Art Institute; Municipal Art Commission; Janesville (WI) Art Association; Indianapolis Museum; Laguna Art Museum; Bancroft Library, UC Berkeley; National Academy of Design; National Museum of American Art, Washington D.C.; Pasadena Art Institute; Pasadena Art Museum; Southwest Museum of Los Angeles; Springville (UT) Museum of Art; University of Nebraska Galleries; Art Institute of Chicago; Oakland Museum; Irvine Museum, CA.